Surilma Urrieta sits in her cement courtyard rocking her 7-month old daughter, Rosymar, as she sips from a baby bottle. The formula it contains is a prized-resource for the family who knows far too well what it means to go without. It was only 2 months ago that Surilma struggled to feed not only Rosymar, but also her twin brother, Eduardo, who were both born premature. Forced to cut back on food, Surilma’s milk supply dwindled. The twins didn’t put on weight. 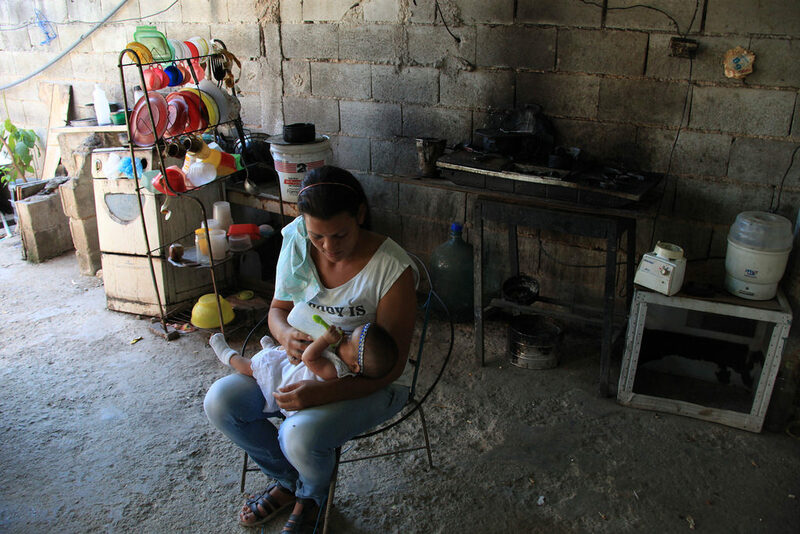 Money was scraped together to buy cartons of milk at 600 bolivares— twice her weekly earnings. “I was so disoriented that I didn’t know to buy formula,” she says. Even if she had, the cost is a hefty 800 bolivares and almost impossible to find. The dairy milk inflamed her children’s stomach, further exacerbating their poor health. The local Caritas Coordinator, Mayra Cardosa, heard of the case and came calling. 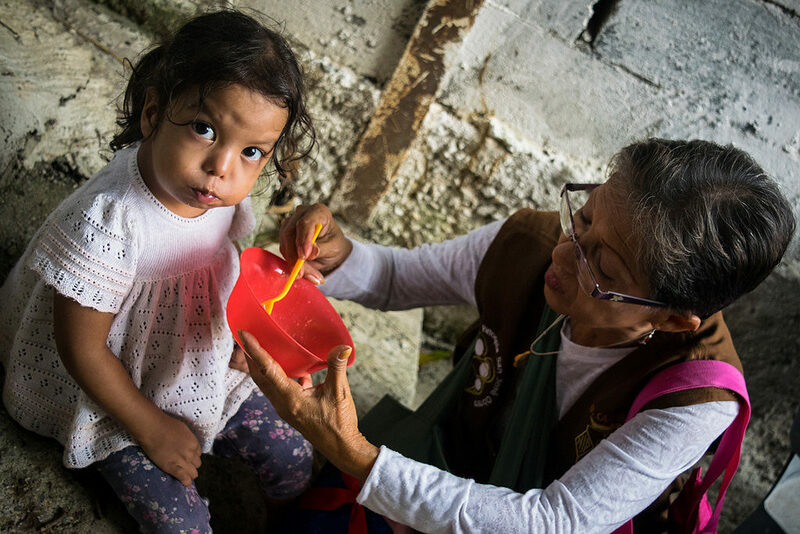 The city of Alianza, where Surilma and her family live, is part of a national network of Caritas Diocese seeking to create a nutritional safety net for expectant and lactating mothers and children under five. Quarterly reports reveal a rapidly growing public health crisis where 68 percent of the children show varying degrees of malnutrition and 48 percent of the selected expectant mothers are at risk of malnutrition. Cardosa leads a weekly weight monitoring sessions where undernourished children receive prescription feedings, and the most severe cases receive emergency medical attention. Surilma’s twins were admitted that very day. Eduardo, the weaker of the twins, wasn’t able to pull through. “The need is so much more than it was a year ago,” says Cardosa. “Families are surviving on yucca. Their skin is becoming yellow.” Each month the monitoring sessions show an increase in extreme cases. January saw a total of 17 percent of the children monitoried diagnosed with severe acute malnutrition a 3 percent jump from the previous month. Cardosa worries about the susceptibility of the children she sees to other illnesses when they don’t have access to a basic preventive measure like soap. The failing economy has crippled the health system and caused diseases once thought eradicated to make a radical comeback. Cases of malaria and typhoid are on the rise with minimal medications in stock to stave off the spread of disease. Each week Cardosa and her team work to fortify the children of Alianza. “We receive the children with a glass of milk and a bit of food,” she says. “We give what we can.” Twice a month the most severe cases are enrolled in the SAMAN programme for therapeutic feeding. Over the course of 4 weeks, participants receive Nutrialimentos, packets of a complete enriched food that is high in fat, protein, and essential vitamins and minerals. A total of 44 parishes in 15 diocese across Venezuela are actively participating with more poised to come online soon.